Railpictures.ca - Mike Molnar Photo: With afternoon thunderstorms firing up to the west, CP 140 meets CP 235 with new wellcars from National Steel Car at East Walkerville. A Kansas City Southern de México AC4400CW in the original grey ghost paint was trailing. The skylines of Windsor and Detroit are visible in the background from this overpass. | Railpictures.ca – Canadian Railway Photography – photographie ferroviaire Canadienne. 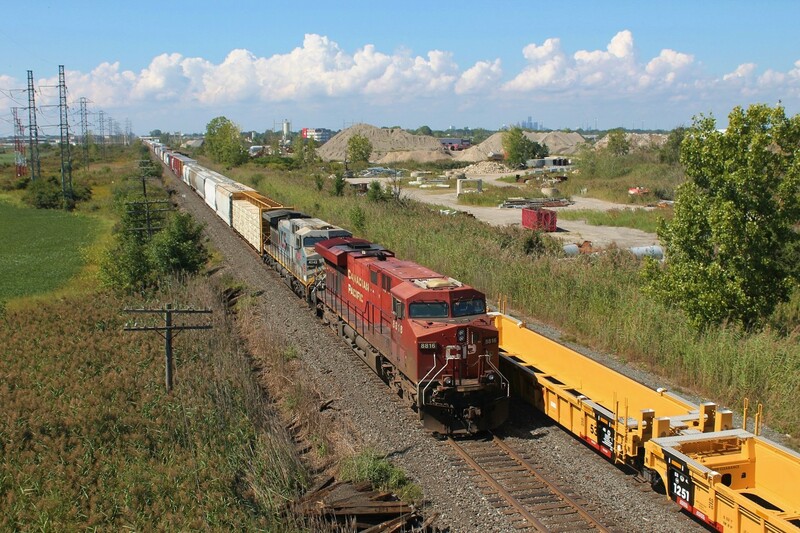 Caption: With afternoon thunderstorms firing up to the west, CP 140 meets CP 235 with new wellcars from National Steel Car at East Walkerville. A Kansas City Southern de México AC4400CW in the original grey ghost paint was trailing. The skylines of Windsor and Detroit are visible in the background from this overpass. Thanks! Was certainly a good day for photos. Nice catch and action on a sunny Saturday!